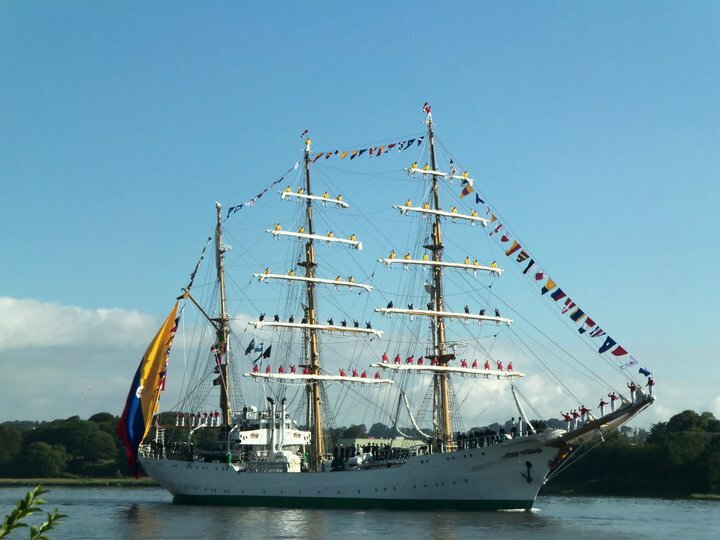 Did any of you make the trip to Waterford to see the Tall Ships race in the summer of 2011? The Tall Ships! Oh what a sight! Majestically silent, beckoning the breeze to lure their non flimsy frames out to open waters beyond the estuary. Bright and beautiful, hot sunny weather, in the oldest city in Ireland. Waterford City, my home town, bearing the crest Urbs intacta manet – city not yet taken. Just an idyllic setting for one of the most spectacular sights ever seen in the sunny southeast of Ireland. Many of us took vantage points all along the estuary, out around Passage East, Duncannon, Woodstown, Ballyhack, Dunmore East and the famous Hook Head peninsula to get a closer view, the best burger, the Guinness. Oh what a fabulous weekend that was! It’s no secret that I am from Waterford! But it never stops me wearing my adopted colours of purple and gold when the occasion calls! …well it’s not something anyone can forget. But I had another reason to be super excited that weekend. I had a musical piece performed in an open air setting on the quay in Waterford, with full orchestra, full choir of children and adults, conducted by the talented, young musician, Niall Crowley who masterminded the commission. Myself and my family sat with our ice cream cones licking and listening, hardly believing our ears. The piece is called Come the Sails! Recently, just last May, the crew of Come the Sails, a very different crew, a crew of my very wonderful musical friends, gave me the most special gift of hearing the piece again, this time in the resounding acoustic of Rowe Street Church in Wexford town. On this occasion it was conducted by another superbly talented young man by the name of Liam Bates. Folks if you feel like it share this memory with me now and enjoy the absolute extravagance of something every composer would ever wish for. To be that “stowaway to the future” may very well be the most precious gift of all gifts. Lend us your sails, your stories too. Lend us your sails, lend us your sails. Breast again the gleaming tide. Every hand will know the ropes. White horses of our hopes. Wind be fair, wind be fair.